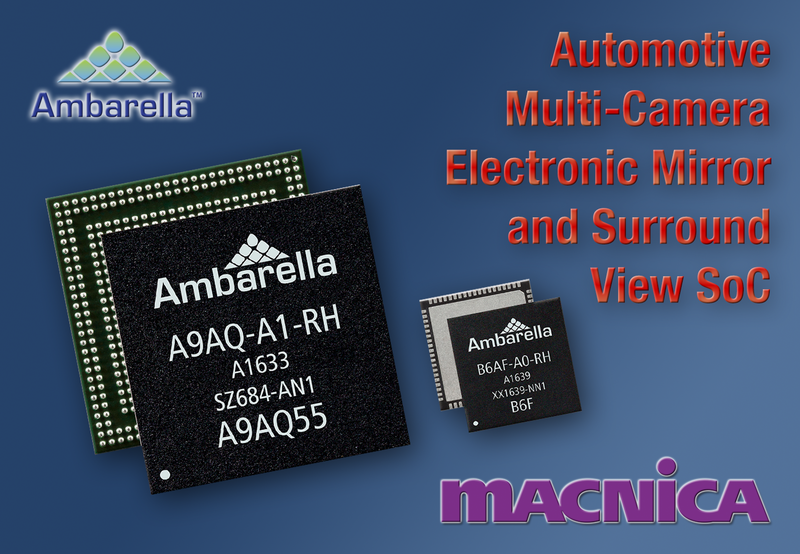 SANTA CLARA, Calif., January 5, 2017 — Ambarella, Inc. (NASDAQ: AMBA), a leading developer of low-power, HD and Ultra HD video processing semiconductors, today introduced its AEC-Q100 qualified A9AQ family of automotive camera System-on-Chips (SoCs). The Ambarella A9AQ is a 4K Ultra HD single-chip solution for single or multi-camera electronic mirror, surround view, and video recording systems. A9AQ features an 800MHz dual-core ARM® Cortex®-A9 CPU to provide powerful processing performance for varied customer applications including advanced driver assistance features, user interface, and wireless networking. Ambarella also introduced its B6 family of 4K Ultra HD capable serializer/deserializer (SERDES) companion chips to enable high performance video camera applications based on the A9AQ SoC. The Ambarella A9AQ provides a single-chip solution for three camera side-view and rear-view electronic mirror systems. Its multi-exposure HDR processing provides superior visibility even in low light or high contrast scenes. LED flicker mitigation dramatically reduces artifacts introduced by LED headlights and traffic signs. The A9AQ can simultaneously drive video to up to three in-car displays for rear, left side and right side electronic mirror applications. For multi-camera parking assistance applications, the A9AQ’s on-chip H.264 encoder enables simultaneous recording of multiple camera streams as well as video streaming to smartphones over WiFi or through in-car 4G hotspots. It provides realistic 3D HD scene rendering using a dedicated image processing engine which provides de-warping and seamless stitching of video from multiple cameras. The A9AQ’s multi-channel image processing removes the need for a dedicated ISP chip in every camera module, enabling highly compact camera modules while improving video quality, reducing power consumption, and lowering system cost. It integrates a four-channel de-serializer, removing the need for external de-serializer chips in multi-channel camera systems. The Ambarella B6 family of SERDES chips provides up to 3Gpixel raw data throughput, allowing Ultra HD at 30 frames per second or Full HD at 60 frames per second with multi-exposure HDR data.